Mississippi currently cares for 700 fewer children and teenagers in foster care than it did 14 months ago thanks to a successful three-pronged effort to reunify families, remove obstacles to adoption and avoid removal of children from birth parents – all while keeping the safety and protection of these children an over-arching priority. We would like to invite you to take part in a web-based research project being conducted by the National Council for Adoption (NCFA) and Northeastern University. The purpose of this research is to find ways to more effectively train and support foster parents in their efforts and care for the foster children in their care. 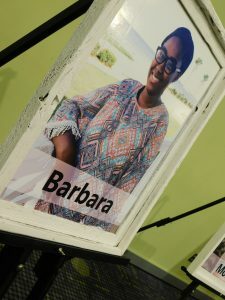 JACKSON— By negotiating a new settlement agreement in the Olivia Y. foster care lawsuit, the Mississippi Department of Child Protection Services (MDCPS) has reached another milestone in its mission to protect the children of Mississippi. The new agreement, approved today by the U.S. District Court, creates clear, obtainable objectives and enhances the ability of the newly-formed MDCPS to direct its full attention to protecting Mississippi’s children. This agreement is the latest step in the reformation of the state’s child welfare system. In December 2015, Governor Phil Bryant tapped Chandler to oversee reform of Mississippi’s foster care system. In May, Bryant signed Senate Bill 2179 establishing MDCPS as an independent agency and dramatically increasing its budget. The change enabled MDCPS to begin enhancing its infrastructure and increasing the number of social workers employed to meet the needs of children and families across the state. “Our children deserve the best care in the nation,” Governor Bryant said when he signed the bill. Approval of the new settlement agreement is a big step forward for MDCPS as it pursues Bryant’s objective. Although the court’s approval of MDCPS’ progress is acknowledged as a positive indicator of the agency’s ongoing work to improve child welfare services, Chandler underscores “a lot of hard work” remains to be done. Under the new agreement, many unnecessarily rigorous reporting requirements under the 2012 settlement agreement have been lifted, freeing MDCPS to devote full attention to accomplishing its mission of protecting children and working to enhance the foster care system. As the system is further improved and critical performance measures are met and maintained for a 12-month period, the individual measures will be removed from monitoring, creating an achievable path toward the eventual end of court oversight. Key to these reforms is increasing the number of social workers across the state. Under the new agreement MDCPS is now able to hire recent college graduates with social work or related human services degrees, and then provide on-the-job clinical training to enhance the skill sets of the new hires. Increasing the number of highly trained social workers will play a tremendous role in optimizing the level of care for children. “This new agreement wisely measures the steps that are most important to reaching our goal of protecting Mississippi’s children and nurturing families – and it will provide quantifiable evidence that we are, indeed, significantly improving the child welfare system in our state,” said Deputy Commissioner of Child Welfare Tracy Malone. “Thanks to the leadership of our governor and other elected officials, we are now able to enact system reform in Mississippi that directly impacts the lives of the children and families statewide. With their support, we are working daily to improve and expand our services. We are putting more well-trained employees into every county of our state. We are recruiting and licensing more foster homes and adoptive, loving parents to care for children in need. And we are focusing all that we do to ensure the safety of every Mississippi child,” added Malone. Among the key metrics mandated under the new settlement agreement is for MDCPS to increase the number of licensed foster homes across the state and to move foster children toward permanency as expeditiously as possible. This means the agency will continue to bolster its efforts to reunite children safely with their parents who have regained stability and, when that is not possible, recruit loving, adoptive families. MERIDIAN, Miss. — It has been a busy year at the Mississippi Department of Child Protection Services (MDCPS). We’ve seen the appointment of our new Commissioner, Dr. David Chandler, continued negotiations with the plaintiffs as part of the Olivia Y. settlement agreement, and made significant progress in the de-coupling of our agency from the Mississippi Department of Human Services. The responsibility of caring for the children of our state rests not just on the newly established agency created to ensure their protection, but also on the very special citizens who have made the important decision to foster Mississippi’s orphans. MDCPS staff alone cannot raise the thousands of children who have found themselves without a loving family, and a safe home to grow up in; we need help. 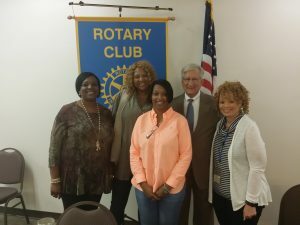 Finding that help starts by addressing the heart of our communities and appealing to those who have joined an organization whose motto is “Service Above Self,” the members of Mississippi’s Rotary Clubs. MDCPS currently has 5,805 children in custody, and every single one deserves to build relationships with caring adults whose first priority is to act on behalf of their best interests. Many of these children have experienced abuse or neglect at the hands of their care givers, some have even been exposed to drug use. There is an immediate need for safe homes across Mississippi. The foster parent “supply” is low, however, demand is high. Considering the theory of “Supply and Demand,” and knowing that demand for the valuable resource of foster parents is high, we can conclude that the cost will, in turn, also be high. However, MDCPS believes there is no price too high when it comes to the safety and protection of a child. Our agency has been restructured, rebuilt, and reborn. Under the leadership of our Commissioner, we will ensure the safety of every child in Mississippi while recruiting, training, and partnering with foster parents across the state, as well as other institutions committed to this same goal. If you’re interested in joining MDCPS on our mission and would like to learn more about becoming a foster parent, contact MDCPS online at http://www.mdcps.ms.gov/become-a-resource-fosteradoptive-parent/ or call 1.800.821.9157. On November 8th, 2016, Commissioner Chandler visited the Booneville Rotary Club in Prentiss County. Pictured above are Regina Taylor, Deidra Calamese, Kerry Shelley, Dr. David Chandler, and Veronica Smith. TUPELO, Miss. — Thanksgiving Day is typically spent gathered together with family and friends to reflect on the passing year while enjoying the tradition of feasting on an elaborate meal, and giving thanks. However, for so many, that just isn’t an option. Mississippi has one of the highest poverty rates in the nation with 22% of our population’s income falling below the poverty line. According to the Center for American Progress’ 2015 data, Mississippi is ranked at #51 with 637,128 of our citizens earning less than $24,250 annually within a family of four. Thousands struggle to make ends meet and put food on the table every day, let alone on Thanksgiving. The National Coalition for the Homeless reports Mississippi as 46th in the nation. Thankfully, the Salvation Army is here to help! The Tupelo Chapter served over 3,000 meals on Thanksgiving Day last year and is looking forward to filling that need again this year at their Red Shield Lodge Emergency Shelter, located at 527 Carnation Street in Tupelo, Mississippi. The Red Shield Lodge is a place for those in need to come and receive positive reinforcement, laundry facilities, a safe place to sleep, and food to eat, all while being surrounded by people who want to help and are willing to listen. Many of the adults affected by poverty have children, and it is the primary goal of MDCPS to ensure that these children remain in their own homes with their parents. “It is vital that our agency, and those like us, do all that we can to keep these families together by providing the necessary resources,” says Dr. Chandler. Find out more about the Tupelo Chapter’s Hope & A Future Capital Campaign or contact the Tupelo Salvation Army at 662-842-9222 or 662-680-2754, or nationally at 1-800-SAL-ARMY (725-2769). JACKSON, Miss. — November is National Adoption Month! Currently, there are 5,557 children in foster care in the state of Mississippi. Of those, 468 are available for adoption and 74 presently do not have adoptive homes identified. With National Adoption Month approaching, the Mississippi Department of Child Protection Services (MDCPS) has been busy exploring ways to help raise awareness across the state, while also celebrating the miracle that is ADOPTION! MDCPS partnered with Governor Phil Bryant and adoptive mother, Judge Rhea Sheldon, to film a new Public Service Announcement focusing on adoption. Both radio and television versions will be aired state wide to let Mississippians know: there are kids right here at home that need you! Please consider opening your heart and your home through adoption by calling 1.800.821.9157. 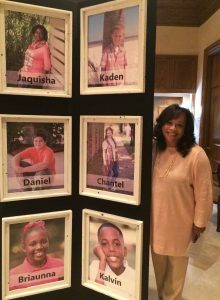 Southern Christian Services for Children and Youth recently collaborated with MDCPS to construct a large portable gallery containing professional photographs of 42 children currently anticipating finding their forever families through adoption. 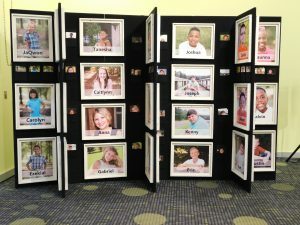 This Heart Gallery display will travel to events across the state not only to raise awareness about the local children awaiting adoption, but to also put faces to the cause. Every single one of these children deserve a safe and loving home. MDCPS has also launched an online Heart Gallery, which displays a complete listing of all the Mississippi children who need adoptive homes, including photographs and profiles. 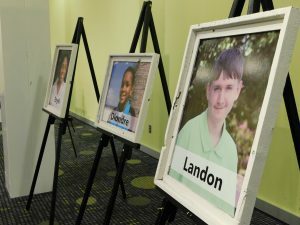 Visit http://www.mdcps.ms.gov/mississippi-heart-gallery/ to view these precious children and to learn more about becoming a foster or adoptive parent. November 28, 2016 at 10 a.m.
November 3, 2016, 11:00 a.m. – 1:00 p.m.
November 5, 2016, 11:00 a.m. – 2:00 p.m.
November 12, 2016, 10:00 a.m. – 4:00 p.m.
November 12, 2016, 11:00 a.m. – 2:00 p.m.
November 17, 2016, 6:00 p.m. – 8:00 p.m.
November 18, 2016, 6:00 p.m. – 8:00 p.m.
November 19, 2016, 11:00 a.m. – 1:00 p.m.
November 19, 2016, 12:00 p.m. – 4:00 p.m.
November 29, 2016, 5:30 p.m. – 8:00 p.m. If you need additional information about any of these events, please contact Chris Alexander at chris.alexander@www.mdcps.ms.gov or call 1.800.821.9157 if you’d like to learn more about adoption. MDCPS Video – The MIRACLE of ADOPTION! JACKSON, Miss. 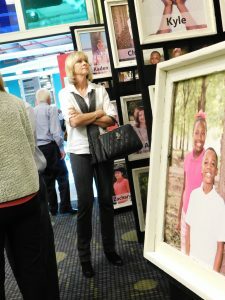 — The Mississippi Department of Child Protection Services (MDCPS) has collaborated with Southern Christian Services for Children and Youth to construct a large portable gallery containing photographs of children currently anticipating finding their forever families through adoption. The Mississippi Heart Gallery Reveal Adoption Event is scheduled for 3 p.m. at the Mississippi Children’s Museum in Jackson on October 25th. You can expect to hear from First Lady Deborah Bryant, while MS NEWS NOW’s Maggie Wade and MDCPS Commissioner, Dr. David Chandler will be in attendance, as well as a host of others with a heart for adoption. Presley Smith, age 11, will be reciting “We Pray for Children” by Ina Hughes. Presley is the daughter of Sabrea and Michael Farris Smith; Mrs. Smith has years of child welfare experience and was instrumental in the development of resources for foster families across the state and Mr. Smith is the award winning author of Rivers and The Hands of Strangers. This isn’t the first time Presley has aided in the recruitment of foster and adoptive homes; she appeared in a brochure at the age of seven with that goal in mind. 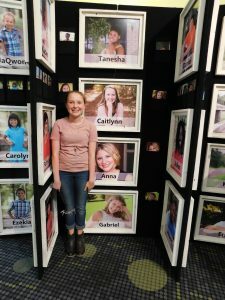 Photographers across the state have volunteered their time and talent to contribute the 16 by 20 photographs that will be exhibited during the event alongside each featured child’s biography. MDCPS recently launched the online Heart Gallery which displays a complete listing of all the Mississippi children who need adoptive homes, including photographs and profiles. Visit mdcps.ms.gov/mississippi-heart-gallery/ to view the precious children presently awaiting adoption and to learn more about becoming a foster or adoptive parent. For more information about this event, please contact Leah Hill with Southern Christian Services for Children and Youth at 601.354.0983 or scscyLeah@att.net. JACKSON, Miss.— The Mississippi Department of Child Protection Services (MDCPS) has again partnered with Mississippi Children’s Home Services, Southern Christian Services for Children and Youth, the Mississippi Community Education Center, and 200 Million Flowers to host another foster parent training weekend, this time at Mississippi College in Clinton, October 21-23. There are currently over 1,000 children in foster care in Central Mississippi, and there are 272 licensed foster homes. Previously, completing the licensing process took several months, with individual classes scheduled each week. In an effort to address the immediate need for more foster parents in the area, Rescue 100 will pack into three days, all the classes that foster parents are required to complete in order to become licensed. MDCPS or a private agency will then follow up with individual home visits shortly afterwards. Mississippi Supreme Court Justice Dawn Beam, who chairs the Mississippi Commission on Children’s Justice, is spearheading the organization of the Rescue 100 programs to more efficiently train foster parents. “We have a tremendous need for loving foster homes for our children. This is an exciting effort working with the courts, local child protection staff, nonprofit organizations and local churches to wrap their arms around our children and their families,” she said. Rescue 100 is a collaborative effort among government, the faith-based community and the private sector to train more foster parents to take care of abused and neglected children. Pastors, judges, potential parents and others interested in our efforts to address the foster parent shortage are invited to attend and can register online at http://www.200millionflowers.org/rescue100/scheduled-training.